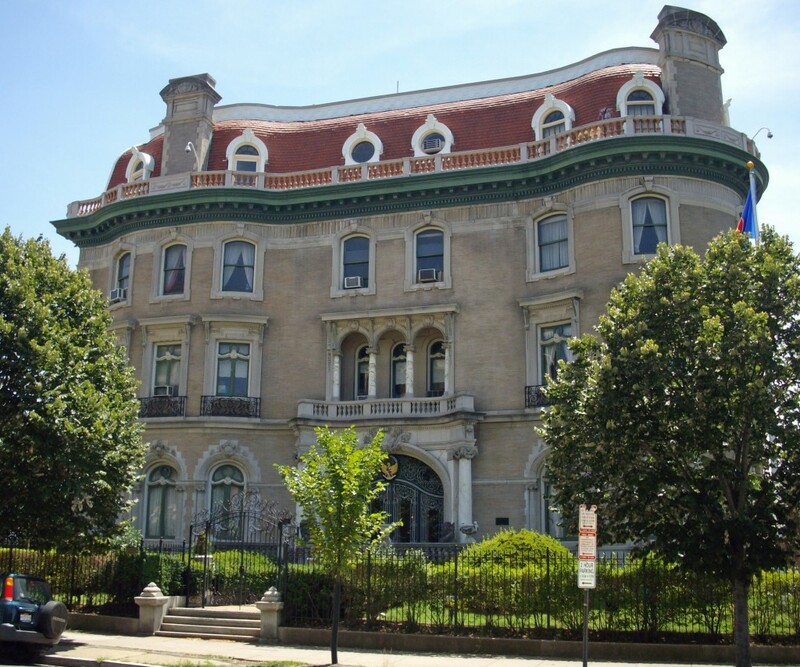 The Indonesian Embassy was once the home of Evalyn Walsh McLean, whose Irish immigrant father hit it rich as a gold miner. This 3 1/2-story brick mansion trimmed with three bands of limestone and a red tile roof was the city’s most expensive private home when built in 1903 at the cost of $835,000. Legend has it a slab of gold was built into the foundation at 2020 Massachusett’s Ave. N.W. They used to call it “2020” to maybe downplay its grandeur. The home contained a staircase to mimicked one on an oceanliner. It has a three-story center hall and grand ballroom for parties that even hosted official state dinners during president Woodrow Wilson’s ill health. It had one of the first elevators in the city and a theater. It even had an apartment used by two European kings. But let’s get to the juicy part. Walsh-McLean was the last private owner the Hope Diamond; the 47-karat diamond now in the Smithsonian’s American History Museum. It is said to be cursed, which Walsh-McLean denied but her brother Vinson was killed in a car crash that Evelyn was badly injured. Her husband Edward was caught in a political scandal and saw his businesses fail and was later declared insane. Evelyn was also taken by a grifter for $100,000 after saying he could rescue the stolen Lindberg baby. After Walsh-McLean died in 1947, the home was used by the Red Cross before sold to the Indonesian government in 1952, A 100-year-old collection of musical instruments, called a gamelan, is featured in one of the main reception rooms today. This entry was posted in Attractions and tagged Best Washington walking tours, curse, Embassy Row Ladies, Evalyn Walsh McLean, Hope Diamond, Indonesian Embassy, Photo by Rick Snider. Bookmark the permalink.